Abu Mohammed's family, originally from Syria, sits at home in Mafraq, Jordan, on Nov. 4, 2016. This house has about 15 people living in two rooms with his second wife; he has another household with his first wife, also with about 15 people. Abu Mohammed, 48, from Aleppo, lives in Mafraq, Jordan. He has two wives, and with his children and other relatives, he is responsible for taking care of about 30 people in his household. The family can't afford to pay for work permits, so he and his older sons do odd jobs in construction and agriculture to earn a living. An informal tented settlement (ITS), home to about 20 Syrian refugees, sits on agricultural land close to the Syrian border. Young Syrian boys help the older men build a toilet for the informal tented settlement (ITS) where they live with other refugee families, near Jordan’s border with Syria. 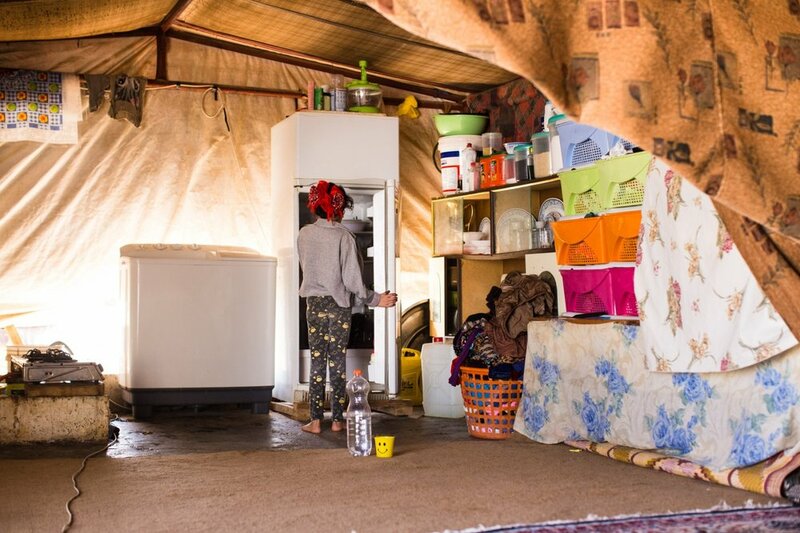 One of the Al Obeid daughters takes fruit from the refrigerator in the tent where the family of seven live. The Al Obeid family fled Homs, Syria five years ago, and since then have been living on their own in a tent just outside Zaatari Refugee Camp in Mafraq, Jordan. The family receives 50 Jordanian dinars in food vouchers, and receives little other assistance. Dahham Al Obeid, 37, and his wife Kafaa, 32, sit with their son Sultan at home in Mafraq, Jordan, on Nov. 4, 2016. The Al Obeid family fled Homs, Syria five years ago, and since then have been living on their own in a tent just outside Zaatari Refugee Camp in Mafraq, Jordan. The family receives 50 Jordanian dinars in food vouchers, and receives little other assistance. A young Sudanese boy stands in line with his mother and other women to buy food from a supermarket with a food voucher they receive from local NGO Collateral Repair Project in Amman, Jordan. Refugees living outside official camps - Sudanese refugees in particular - receive little aid and often feel neglected by the UN and international NGOs. Sudanese women sit with their children outside a supermarket in the Jebel Ashrafieh neighborhood of Amman, Jordan, while they wait their turn to use their monthly 25 JD ($35) food voucher to purchase groceries for their families. Two young Iraqi girls play with balloons in the window of Collateral Repair Project’s community center in the Hashemi Shmali neighborhood of Amman, Jordan. The center provides educational activities for children as well as vocational training and language courses for adults. An Iraqi man sits in a men’s group therapy session at the Collateral Repair Project community center in Amman, Jordan. The men pass around a string of prayer beads and take turns sharing whatever is on their mind, giving them an outlet to deal with trauma they’ve witnessed, or the frustrations of not being able to work in Jordan. Iraqi Assyrian women chat with each other after a church service in Amman, Jordan. 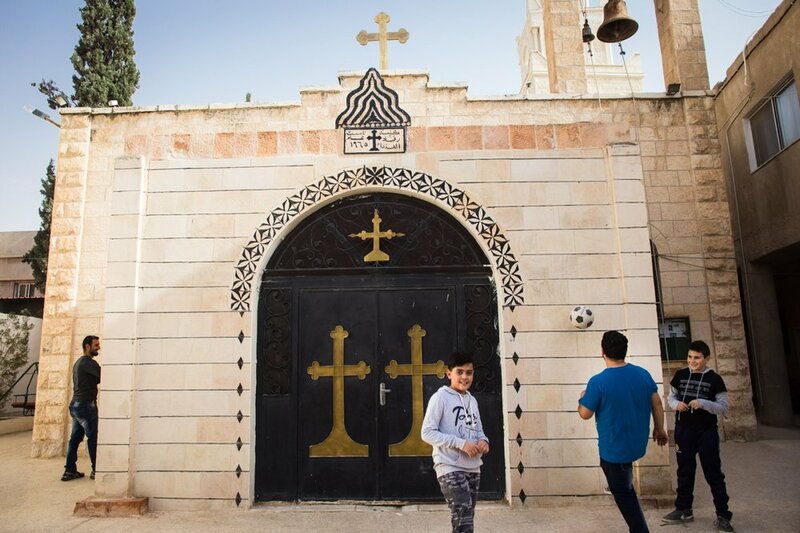 While there were a small number of Jordanian Assyrian Christians, the church’s congregation more than doubled after Christians and other minorities fled ISIS in 2013. The church provides buses to and from the church so its members can come from other parts of the city. Jordanian Christian youth play and socialize outside an Orthodox Church in Mafraq, Jordan, on Nov. 4, 2016. About four months ago, the church started an educational program for kids, and quickly took in young Syrian refugees - whether Christian or Muslim - to make sure the kids are getting a good basic education, even if they aren't able to attend school. Farah (left), from Mosul, enters the church with her two daughters, Valentina, 7, and Faustina, 4. Farah was a civil engineer in Iraq, but now she and her husband are living off their savings, being unable to work in Jordan. She says the family have no plans to return to Mosul, saying it will still be too dangerous for Christians. Valentina, 7, stands in the doorway of the Mar Youssef church in Amman, Jordan, on Nov. 4, 2016. She has lived in Amman with her family since fleeing Mosul over a year ago when ISIS took over. Father Dimitrius Samawi, the priest of the Orthodox Church in Mafraq, Jordan, sits in his office on Nov. 4, 2016. Father Dimitrius described it as his Christian duty to be a force for good in the Syrian refugee community, especially to help the children, no matter what religious background they come from. Young Syrian women attend courses taught by volunteers at the Souriat Beyond Borders center in Amman. Since many of them were forced to miss school for some time due to the war, the classes help them get caught up so they can take university entrance exams. An Iraqi man takes notes during English classes at Collateral Repair Project’s community center in Amman, Jordan. 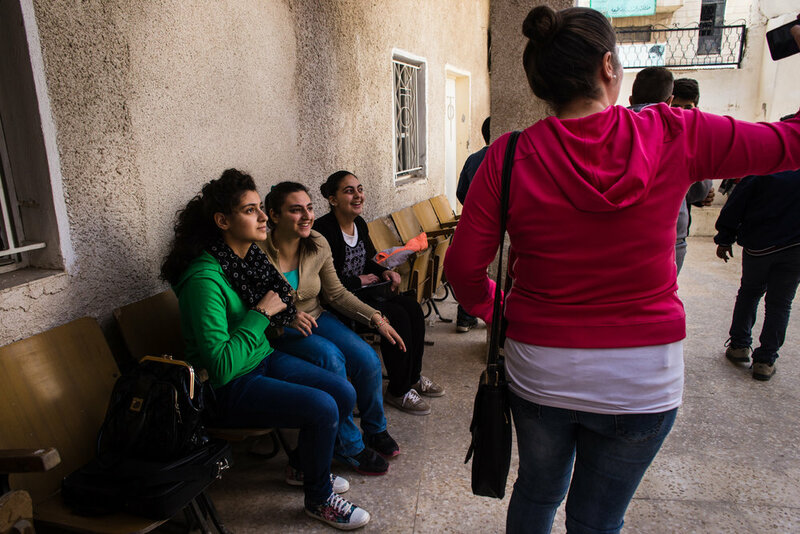 Iraqi Christian women talk together after an English class at Collateral Repair Project’s community center. 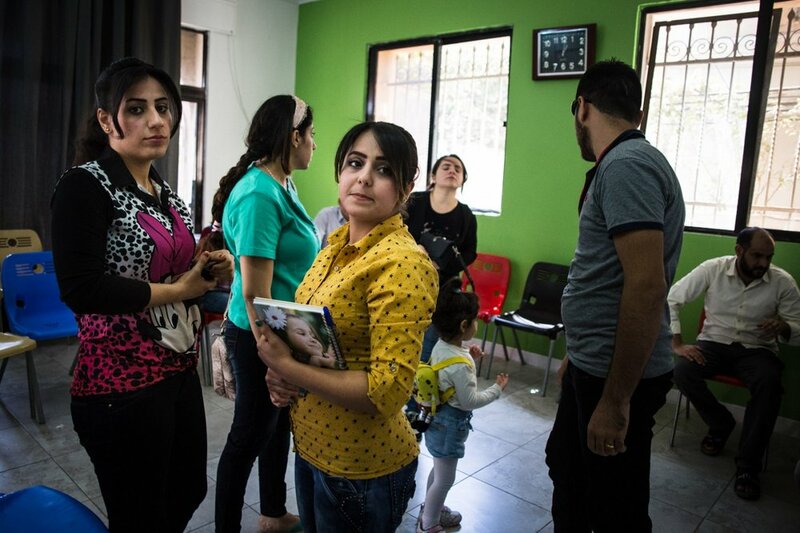 Many of the families who come to the center are awaiting resettlement in other countries, and want to learn English to prepare for their new life, or in hopes of finding better job opportunities in Jordan. Ahmed Jansis, 41, sits with his wife Um Mohammed, mother, and son Hamzah at home in Mafraq, Jordan, on Nov. 4, 2016. 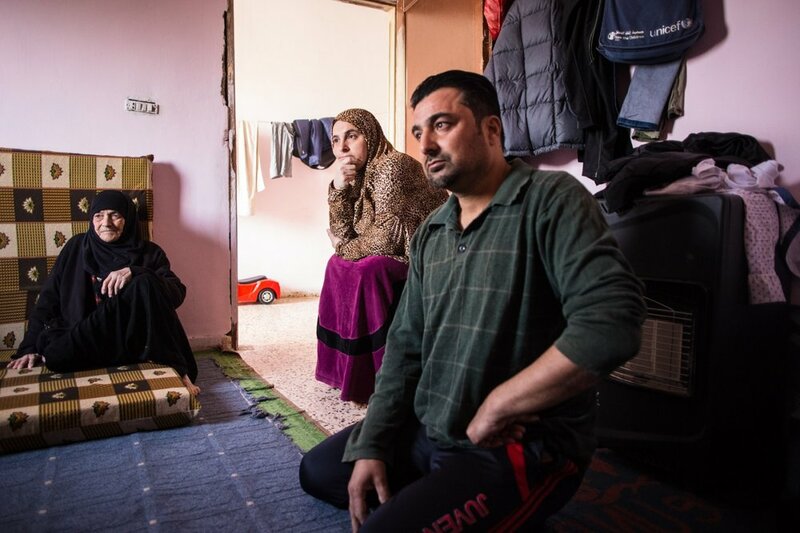 The family came from Aleppo, where Um Mohammed worked as an English teacher, and now both parents do odd jobs to earn a basic income for the family. Abu Hamad (not pictured), a Jordanian citizen, owns a butcher shop in Mafraq city and employs four Syrian refugees. He paid for all of their work permits so that they could work legally in Jordan. Iraqi and Syrian children attend a summer camp program at Collateral Repair Project’s community center in Amman, Jordan. Iraqi and Syrian children play together at Collateral Repair Project’s community center in Amman, Jordan. An Iraqi Kurdish man holds his daughter, Mariam, up on the wall after picking her up from an after school program. His family has been in Jordan for several years and were waiting on a visa to the US. 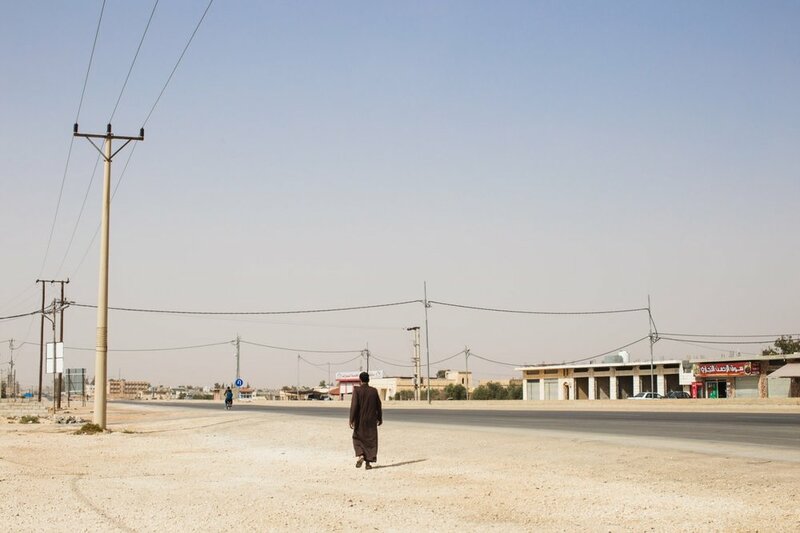 A man walks along the desert stretch of road outside of Za’atari Refugee Camp in northern Jordan. In 2016, the EU scrambled to strike political deals to reduce the numbers of refugees reaching its shores. In 2018, the US has accepted only 11 Syrian refugees so far. The vast majority of refugees who have fled the wars in Iraq and Syria will never see resettlement in the EU, the US or Canada. While Turkey hosts the highest number of registered refugees at 2.7 million, it is estimated that a full 33 percent of people in Jordan are refugees - whether from Syria, Iraq, Palestine, Sudan or Somalia. While Za'atari Refugee Camp is home to some 70,000 refugees, making it one of the largest refugee camps in the world, many more refugees live outside the official camps and either live in informal tented settlements (ITS) or in urban centers like Amman, Irbid, and Mafraq city. 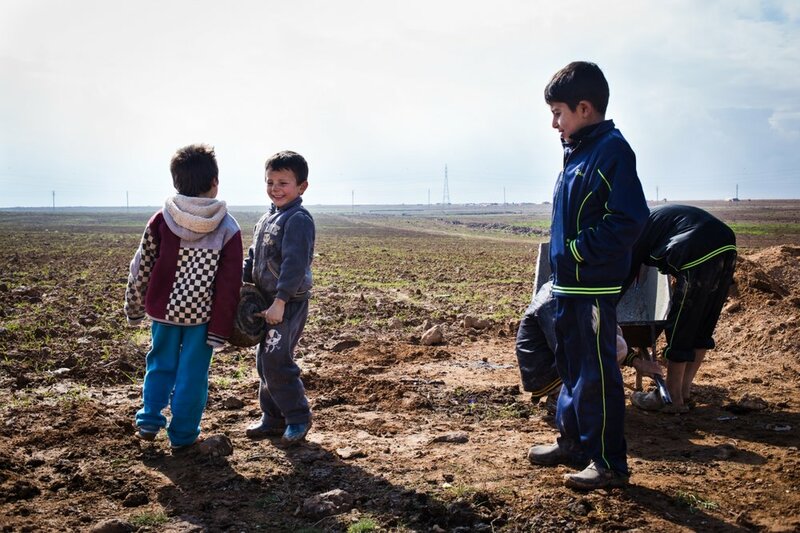 Some never lived in Za'atari, while others chose to strike out on their own, hoping to leave behind the restrictions and violence that plagued the camp. But outside the camps, refugees often live beyond the reach of UN organizations and NGOs; some live in fear of being arrested for working illegally, while others are left vulnerable to predatory situations. UNICEF and Jordan's Ministry of Education have stepped up efforts to get refugee children back in school, but many children - especially those living in ITSs - were unable to attend due to overcrowding in schools, lack of transportation, or the fact that they have to work to help support their families. Many families are waiting for a shot at resettlement elsewhere, but others, having exhausted their finances or lost all their family, are struggling to eke out a living and survive in limbo, from farmlands on Jordan's border with Syria, to the impoverished neighborhoods of east Amman.